The Carson-Newman online Bachelor of Science in Nursing (RN to BSN) degree program prepares registered nurses in Colorado to become more complete and autonomous caregivers. Carson-Newman online RN to BSN students learn to employ critical thinking, evidence-based practice, advocacy, ethics and the principles of servant leadership to improve community health, patient outcomes and their nursing practice in Colorado. The online RN-BSN program prepares Colorado registered nurses for the next step in their practice and allows most RNs to qualify for advancement opportunities that would otherwise be unavailable at the Associate’s Degree in Nursing level. Today the RN to BSN degree in Colorado means a more prepared and engaged nursing professional who provides more than the basics of clinical care, being able to accurately assess patients, make decisions and communicate effectively. That’s why many hospitals and health care providers now insist on the BSN as the minimum credential for employment or advancement. To meet the more complex demands of today's health care environment, the National Advisory Council on Nurse Education and Practice has recommended that at least two-thirds of the basic nurse workforce hold baccalaureate or higher degrees in nursing. All of this means that, in general, registered nurses with a Bachelor of Science degree in nursing (BSN) will have more opportunities for positions and career advancement. Colorado is the state with the highest elevation, and has over 1,000 Rocky Mountain peaks that are higher than 10,000 feet. The most famous of the mountains is Pikes Peak. Colorado also encompasses the northeastern section of the Colorado Plateau and the western Great Plains. Colorado is located to the south of Wyoming, southwest to Nebraska, west of Kansas, northwest of Oklahoma, north of New Mexico, east of Utah, and northeast of Arizona at the Four Corners. Colorado has a population of approximately 5,540,545 and its economy consists primarily of the service industries and manufacturing. Earning an RN to BSN degree can prepare you for greater career mobility in Colorado. According to NursingLicensure.org, Colorado has eight facilities with Magnet designation, located in six cities. The Magnet hospitals in Colorado have quotas for nurse manager positions and some also hire BSN nurses for several other RN positions. While the Colorado Board of Nursing licenses RNs and LPNs and sets educational and practice regulations, actual RN to BSN requirements are set by each university. As mentioned above, an unencumbered RN license, official transcripts from all post-secondary educational institutions, an ADN or Nursing Diploma, and a minimum 2.75 cumulative GPA are required to be admitted to Carson-Newman’s online RN to BSN program. The American Nurses Association encourages nurses to have completed their BSN within ten years of earning their RN licensure. 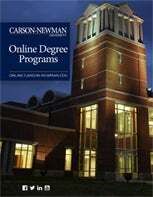 For Colorado RNs seeking information about how to become a nurse practitioner after completing their BSN, Carson-Newman’s online Master of Science in Nursing - Family Nurse Practitioner (MSN-FNP) program prepares Registered Nurses who possess a Bachelor’s degree and an active and unencumbered RN license for advanced practice opportunities such as a Family Nurse Practitioner. It can take as few as 32 months to obtain an online Master of Science in Nursing - Family Nurse Practitioner degree after earning a BSN. Carson-Newman’s (C-N) online RN to BSN program allows working nursing professionals in Colorado to balance a busy professional life with higher education goals. With a distinct curriculum delivered through an engaging and supportive learning environment, the C-N online learning environment promotes a sense of connection and community while you interact with faculty, support staff and classmates. While earning your degree, you will expand your lifelong career network. While learning how to become a BSN-prepared nurse at Carson-Newman, you’ll be taught to make informed patient care decisions using evidence-based practice. Conducting accurate assessments with the best evidence available and providing effective care are tenets of the Carson-Newman RN to BSN program. C-N takes a holistic approach in caring for patients, and RN-BSN graduates seek and obtain resources that positively affect the lives of patients. The salary for a BSN-prepared nurse can range between $60,000-$100,000 according to U.S. News, depending on the location, facility, as well as the individual’s work experience. The standard average salary for Colorado nurses with a Bachelor’s degree is approximately $70,536 per year, according to Salary Expert.